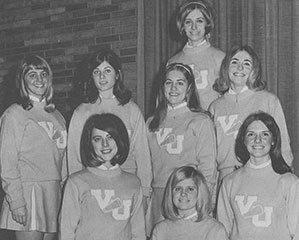 Valpo Cheerleaders—From the 1969 Beacon, Valparaiso University’s yearbook. Man first walked on the moon; nearly 400,000 showed up at a rock and roll festival (Woodstock) on a farm in Bethel, New York; the Beatles “Get Back” stayed at the top of Billboard’s list for five weeks; and the Valparaiso campus continued to graduate the very best in the long-standing Lutheran tradition of scholarship, freedom, and faith to prepare students to lead and serve in both church and society. At no other time in history has the need been greater to “give back” to the many future students who will come here in the pursuit of truth, wherever it leads. They seek to become leaders, and, more important, they seek to serve in the world to make a meaningful difference in the lives of others. Your support ensures the continuation of those deeply rooted Valpo values. All future gifts provide meaningful support and will help shape the future of Valpo and the ability to fulfill its mission. If you have already included the University in your future plans, let us know. We would be delighted to welcome you into the Kretzmann Society. Deferred gifts also support Forever Valpo: The Campaign for Our Future, a $250 million endowment campaign that will secure permanent resources for scholarships, faculty development, and programs that prepare students for lives of leadership and service. Please contact us to find out more by calling 219.464.5147 or emailing giftplanning@valpo.edu.